An extensive range of test and measurement products for the power utility maintenance industry as well as domestic and industrial electricians. The equipment covers all aspects of substation installation, commissioning and testing, - cable testing and fault location, - domestic and industrial electrical installation, compliance testing and general electrical maintenance. Latest Generation of infrared cameras from the worlds leader in this technology. Packed with new features, bigger-brighter displays and higher resolution detectors these cameras are ideal for condition accessment of equipment in a wide range of industrial, power and building applications. Features a large graphical display with measurement to 40TΩ. Able to be used in environments where high induced voltages may occur. DV-Power are offering 20% off the normal trade price of their powerful CAT-P Circuit Breaker Analyzer. 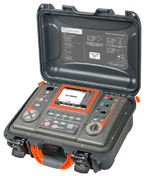 The CAT-P is capable of both On-Line first trip and offline timing measurements. The following links may be useful in sourcing allied information related to our products and services.